Thanking Debby For this R&R Theme. One of the many things in life that I find relaxing, is watching the passing parade of tropical fish swimming. I agree with you, Carol! Looking at this beautiful photo, I feel relaxed, too! Beautiful shot Milli. I love all the exotic colours of tropical fish. Yes, it is relaxing to watch them. Absolutely beautiful. I used to have an aquarium. No room for one now but I might get a Beta. I saw a photo of a small indoor water garden, I want one with a Beta in it. well, i prefer a sporting fish dangling on the end of my line..lol. Fish are fun...this one is sooo blue, too. "Im in a blue mood - as relaxed as a fish can be when there are no pred's after your hide." Thanks for your comment, dear. ohhh, this is gorgeous, Milli! I love the colors...so alive! My dad kept an aquarium and I loved watching the Angelfish when I was a child. It IS relaxing, mesmerizing, even. I miss that! I tried to keep an aquarium for years, for the kids and grand kids, but it's a lot of work! Now I can just take a trip to Coney Island to the NY Aquarium...much more relaxing! Is it any wonder that many medical offices are equipped with aquarium........a definite stress reliever and splashed with beauty and grace. 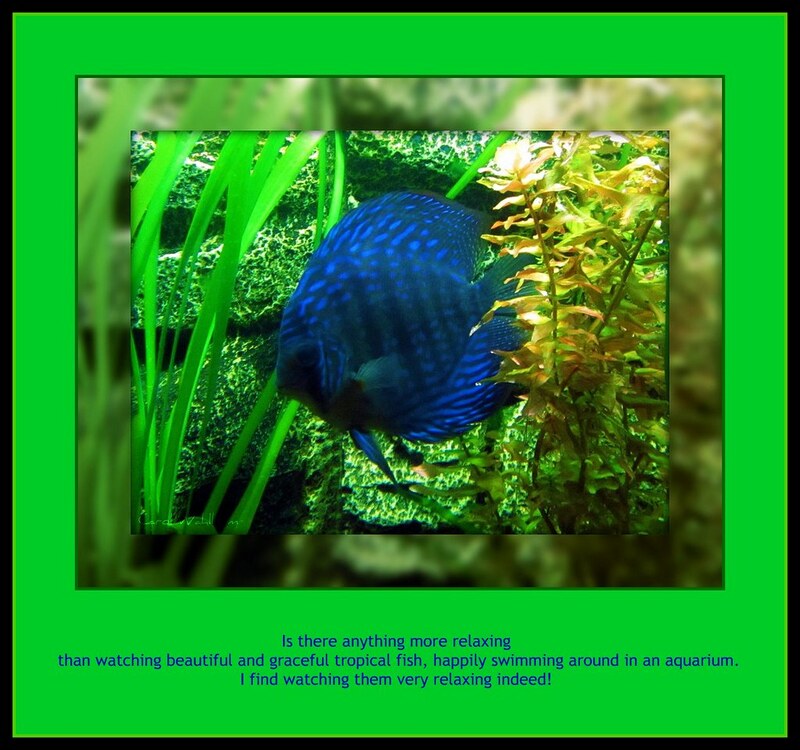 Images & WSords #151~ " Rest & Relaxation"
I love the colors of tropical fish. This one is beautiful with it's spots. i also love your frame looks like it fits in the aquarium. Byoootiful! Yes, fish are so meditative to watch. Lovely! Very true Milli , loved the fish . Oh this is beautiful! So colorful! By the time the fish has gone from one side of the tank to the other you've forgotten where it started from!